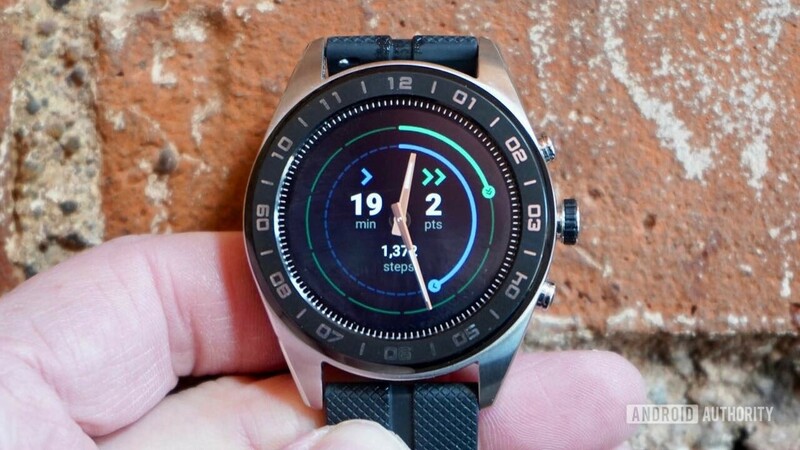 LG took a hands-on approach with the W7, its latest Wear OS smartwatch. The wearable boasts a pair of physical, moving watch hands. This novel idea means it’s always easy to check the time. LG’s unique approach, however, makes for a frustrating experience. Moreover, missing features such as GPS and a heart rate monitor hurt the W7’s value. LG’s Watch W7 enters a crowded field of Wear OS-based smartwatches made by both tech and fashion companies. With so many wearables from which to choose, standing out is harder and harder to do. 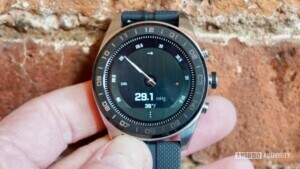 LG devised a plan for the W7 in order to give it a distinct appeal: The watch features moving hands. You know, like an actual, old-school, analog timepiece. Is this marriage of analog and digital a match? I’m not so sure. The LG Watch W7 is unremarkable in nearly every way. The watch could easily be mistaken for any department store offering. Your own sense of style will dictate whether that’s a good thing or a bad thing. LG developed the W7 in partnership with Soprod SA, an honest-to-goodness Swiss watch company. The W7 features a strong stainless steel chassis. The curves are elegant in their own way and I like the chamfered edges and visible grain in the metal. LG gave the watch a chunky black bezel, also made of steel, that includes the hourly time markings. The numbers are painted on in reflective chrome. A rounded steel plate covers the bottom. There are no sensors embedded into the underbelly, though you will spot the copper charging contacts. Most of the time the watch face is pitch black. The moving hands are chrome-colored and have glow-in-the-dark paint like my Swatch did in 1989. There’s no question the hands stand out. It’s easy to read the actual time in just about any environment and lighting. This is truly helpful. LG didn’t bother conjuring up a fancy marketing name for the material used by the strap. It’s rubber. I don’t really care for it, but it fits and is comfortable. Thankfully the straps can be swapped out for any standard 22mm alternative. Three beefy buttons are on the right side. A thin rubber band gives the main crown some traction, making it easier to turn. Spinning the crown will scroll the face through the quick settings and notifications. Neat. The lower button can be customized to open any app on the watch. The Watch W7 has a 1.2-inch LCD with 360 by 360 pixels, resulting in 300ppi. It’s respectably sharp and bright. Colors look good and it never got washed out in the sun. An OLED display might have deeper blacks, but the W7’s screen surely suffices. The watch scored an IP68 rating, meaning it is protected from immersion in three meters of water for up to 30 minutes. However, LG warns that the W7 is not to be used for swimming or diving. No pool workouts or cliff jumping for you. The watch covers the basics, but is missing some vital features. 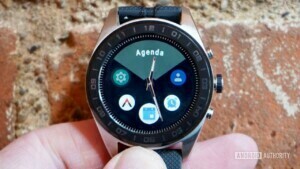 The latest rendition of Wear OS is better than its predecessors, of that there’s no question. The W7 runs the very newest build, Wear OS 2.2. I like the general idea of the revised user interface, which has you swiping in all four directions to gain access to Google Assistant, settings, notifications, and Google Fit. This is all great. A quick press of the crown opens the app drawer and a long press activates voice search. Spinning the crown spins the app drawer in a circular motion, much like Samsung’s Tizen watch platform. This lets you cycle through all the apps quickly. The most recently used apps are always loaded first. The lower hardware button opens a second app drawer of dedicated outdoorsy apps called Master Tools, such as an altimeter, barometer, compass, and such. The process of reprogramming the button to open a single dedicated app isn’t too taxing. The Watch W7 runs the Qualcomm Snapdragon Wear 2100 chipset with 768MB of RAM. This is not Qualcomm’s newest or fastest processor, though is enough to provide speedy performance throughout. I didn’t encounter laggy apps. Every facet of the OS loaded quickly and ran smoothly. The Bluetooth 4.2 radio kept the watch in sync with my phone no problem. In fact, the watch was often buzzing with notifications before the phone did. Wi-Fi is aboard, too, and it is handy for downloading maps or playlists to the watch. What’s missing? Quite a lot. The most egregious omission is GPS. Without independent GPS, the watch cannot be used to effectively track workout routes on its own — your phone will have to come along for the ride. There’ s no NFC, so no Google Pay. There’s no heart rate monitor, so you won’t be able to keep tabs on your heart health. These missing features make the battery life all the more frustrating. The battery is relatively small at 240mAh. When used in full smartwatch mode, the W7 makes it to the end of a day just barely. I often hit the 10 percent reserve after a 15- or 16-hour day. Keep in mind, this is without GPS, without heart rate monitoring, and without LTE. LG did create a fix for the battery: Just Watch Mode. Opting to use the W7 as only a watch ensures it will run for up to 100 days. The mode turns off the LCD screen entirely, as well as all the radios, apps, and smartwatch functions. The Soprod-designed micro gearbox inside is very efficient, according to LG. The watch doesn’t include a second hand, and the minute hand clicks forward only once every 60 seconds rather than spin constantly. This allows the battery to last a long time. You can opt to put the W7 into Just Watch Mode at any time, such as when on an airplane or during a theater show, to conserve power. In other words, it’s a balancing act. I’ll give LG credit for coming up with a novel device in the Watch W7, but it’s that very novelty that sinks the watch. The hands. My god, the hands. They are so aggravating. When I first experienced the W7 I thought to myself, “What a neat idea, real watch hands!” The reality is not as inspiring as the dream. The watch hands are always in the way. The chrome-colored hands may be slim, but they often obscure content on the LCD beneath. Scrolling through notifications, messages, calendar appointments, settings screens, and more requires you to jog the content down, then up, then down again so you can fully read it. LG cooked up a trick meant to clear the hands out of the way, but it is basically worthless. A long press of the upper button causes the hands to take one of four positions: both at 12, both at 3, both at 9, or one at 3 and one at 9. The idea is to minimize the area obscured by the hands. It’s something, and yet not enough. The W7 scores an “E” for effort. At launch LG priced the Watch W7 at $445, a figure strikingly high given the lack of features. Thankfully the price has come back down to earth a bit since. A few retailers are selling the W7 for $230. Who is this watch for? The W7 is decidedly not for those who want a fitness companion. If you’re in the market for GPS tracking and more, you’ll be better served by a Fitbit Ionic (or Fitbit Versa if you don’t need on-board GPS). It might also be worth considering the TicWatch Pro, which, at $199, offers battery savings tools and doesn’t have cumbersome watch hands. I think the W7 is meant for those who want a watch — a classic watch with real hands — more than they want a smartwatch. It’s better to think of the W7 as a timepiece that can be smart on occasion.